Inspiration for recipes on The Misanthropic Hostess come from all over the place. Sometimes I’m attracted to a new idea, ingredients or technique I haven’t worked with. Other posts are inspired by memorable meals and childhood favorites. And then, sometimes, I try a recipe for this singular reason: get in my belly! This is one of those recipes. Bon Appetit has this new thing going on where they offer additional recipes via mobile/tablet interface that don’t appear in the print magazine or, as far as I’ve seen, Epicurious. They show you the picture and then send you to the mobile. Such a tease. Anyhow, this is one of those recipes. Who doesn’t love chocolate and coffee together? A single recipe makes three eight-inch cakes. The crumb is pretty fine and loose. If you are going whole-hog and decide to frost these babies, I suggest freezing them first. 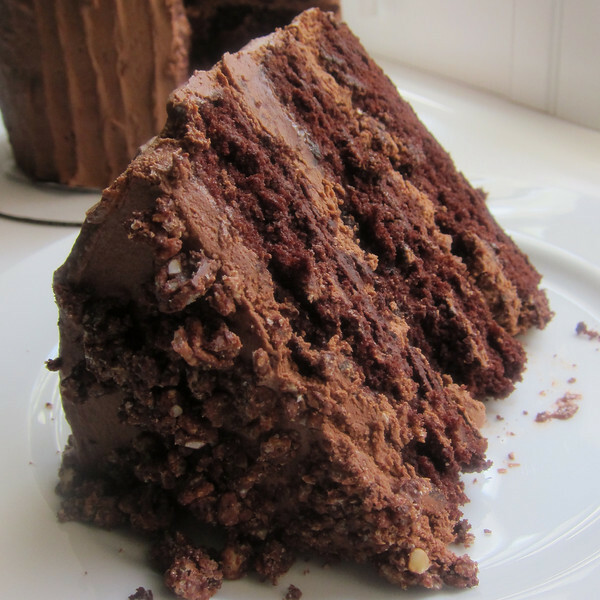 While I liked the frosting included in this recipe, I still haven’t found the perfect chocolate frosting. Good thing I like research. Here is what makes this recipe special. That hazelnut crunch pictured above? It finds its way into each layer of the cake. It’s like a little crunchy Nutella surprise! Remember to leave some for the top. Now, who needs a glass of milk? 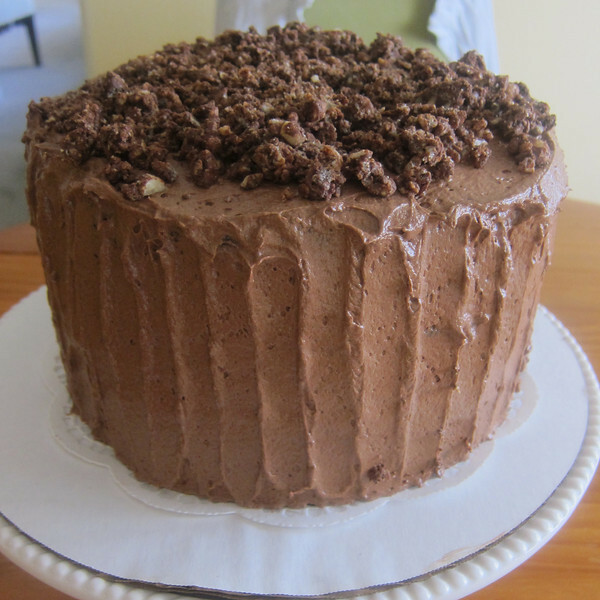 The only suggestion I have is to maybe chop the hazelnut crunch to a finer grain for the middle cake layers. As you can see from the piece below, the generous chunks sort of got in the way of the layer-flow. This is a great special occasion cake indeed! And no TD, no peppercorns. I discovered this new dude name Phillip Phillips. Guess who doesn’t watch American Idol? Grease 3 8″ cake pans, line bottoms with parchment. 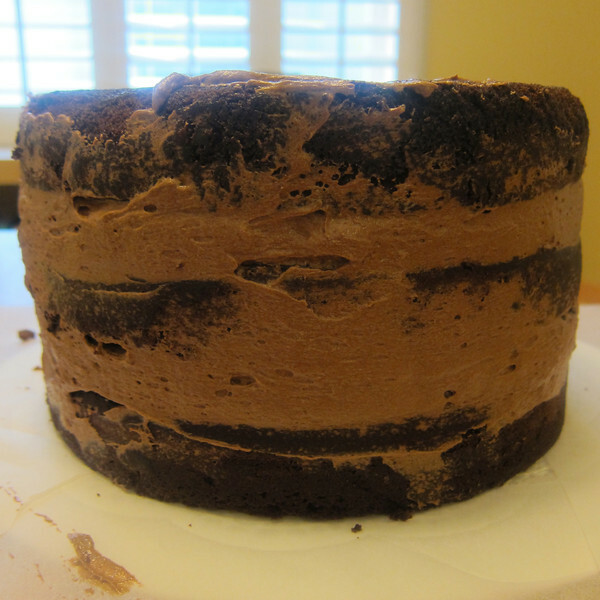 Sift cake flour, cocoa powder, baking soda, salt and baking powder into a medium bowl. In a separate bowl (better yet, if you have it, use a multi-cup pyrex liquid measuring cup), dissolve espresso into hot coffee, whisk-in buttermilk, set aside. In a stand mixer (or with an electric mixer), beat sugar and butter until light and fluffy (5ish minutes), scraping-down bowl as needed. Add eggs one-at-a-time, beating in between additions. Beat in egg yolk and vanilla. Beat on high speed until doubled in volume and very fluffy, about 3 minutes. Scrape bottom of bowl well making sure all ingredients are incorporated. Beat 1 more minute. With mixer on low, beat in flour and coffee mixtures in alternating pattern, starting and ending with flour. Bake until tester inserted into center comes out clean (about 20 minutes). 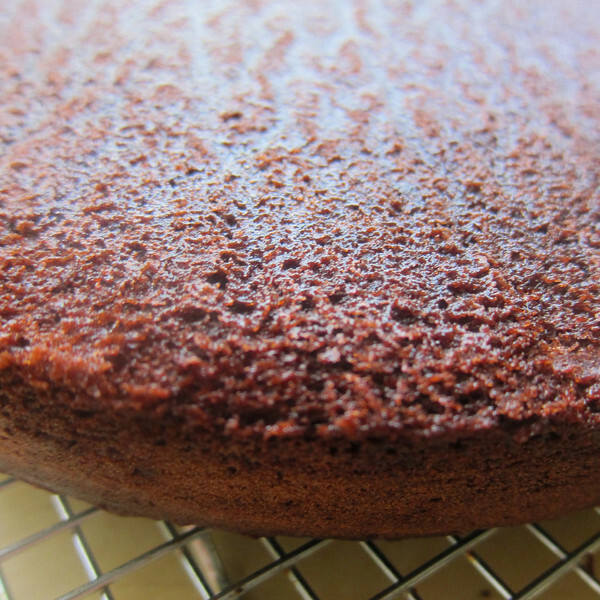 Transfer to wire racks, let cake cool in pans for 30 minutes. Invert cakes onto racks, peel off parchment and let cool completely. I like to do this step in advance, wrap each cake tightly in plastic wrap and then freeze. These cakes will be much easier if frosted while frozen. 1 C (2 sticks) chilled, unsalted butter, cut into 1/2″ pieces. Combine both chocolates and corn syrup in medium bowl. 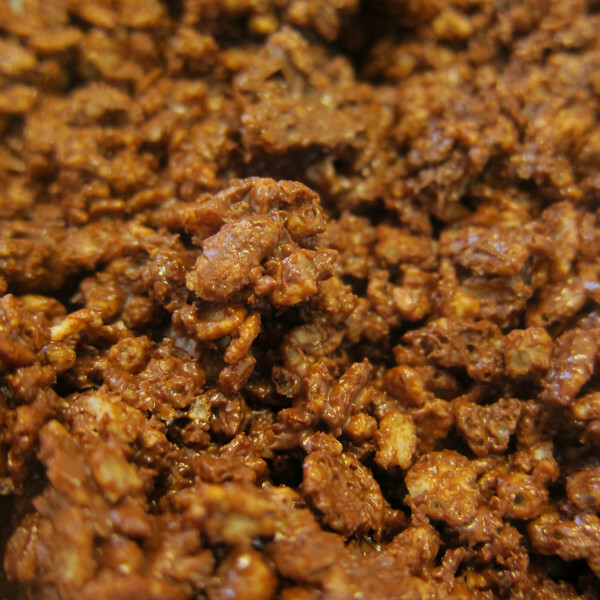 Bring cream to barely a boil in a small saucepan; pour over chocolate mixture. Let sit for 2 minutes. 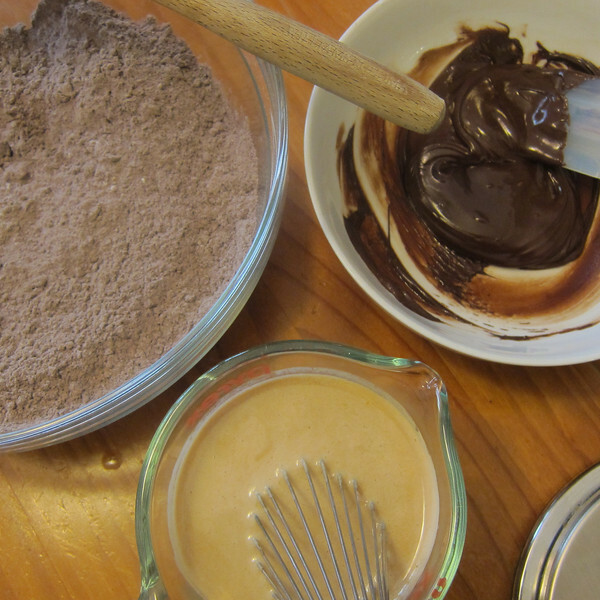 Whisk until chocolate is melted and mixture is completely combined. 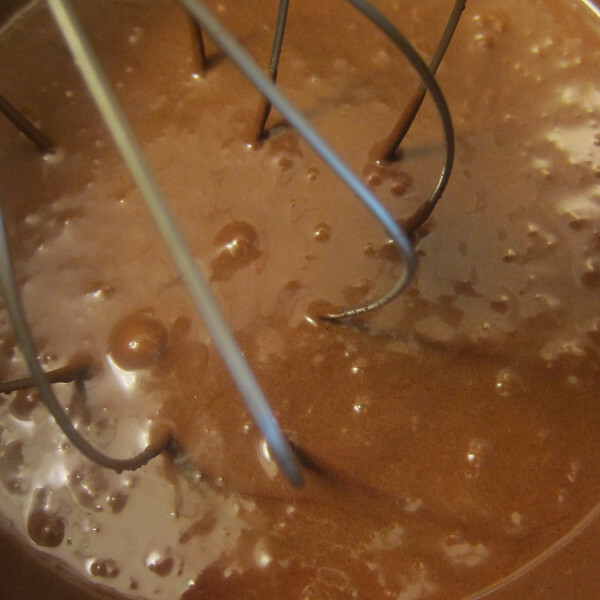 Using a standing or electric mixer, beat chocolate mixture until cool, 5-6 minutes. Add-in butter a few pieces at a time, beating until incorporated between additions. Continue to beat until thick and lightened in color (between 5-15 minutes). If kitchen is hot or frosting feels thin, refrigerate. Level-off cakes using a serrated knife. 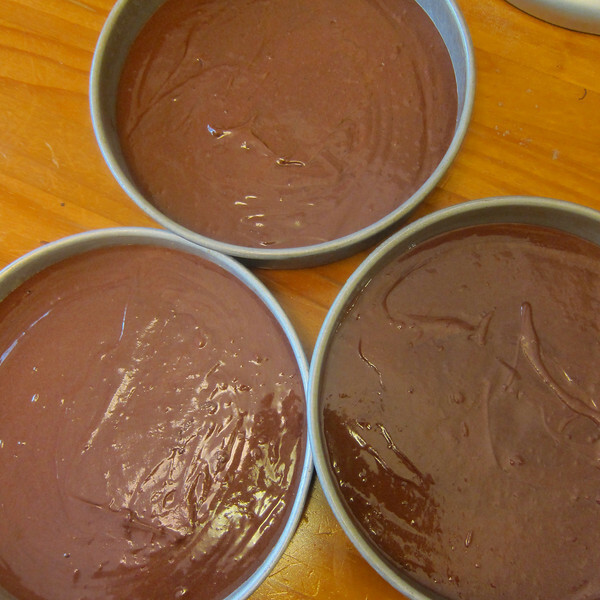 Place 1 cake layer on a large plate or stand. Using an offset spatula, spread about 1 cup frosting on bottom layer. Spring 1/2 cup hazelnut crunch over frosting. Place second layer over crunch. Repeat. Top third layer with frosting and decorate as desired. Finish with hazelnut crunch. Chill until frosting is set (3-4 hours). Wow, that is some sky-high cake! I’ve got to check these Bon Appétit recipe extras. This is why my i-Pad is covered in buttery fingerprints. Oh holy hell this looks good! What are you doing to me?!? 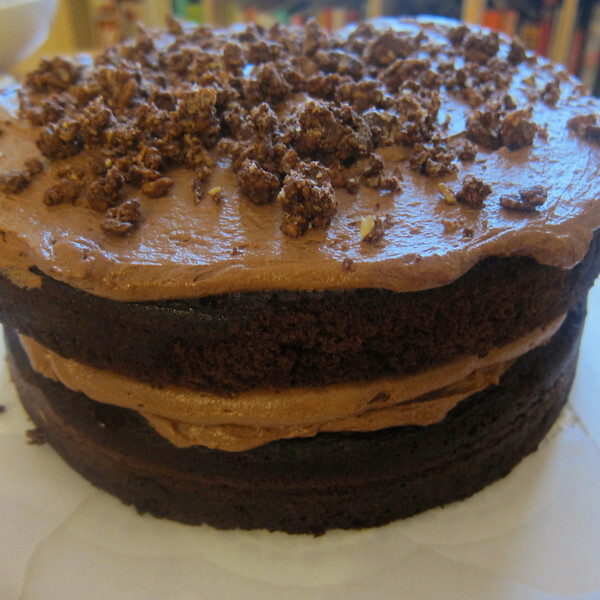 Three layers of chocolate goodness? Sign me up. Shut Up: I’ll trade you some of those popovers on your site for some of this cake. Seems fair :).